Who's ready for spring?! Oh, boy! I am SO ready! 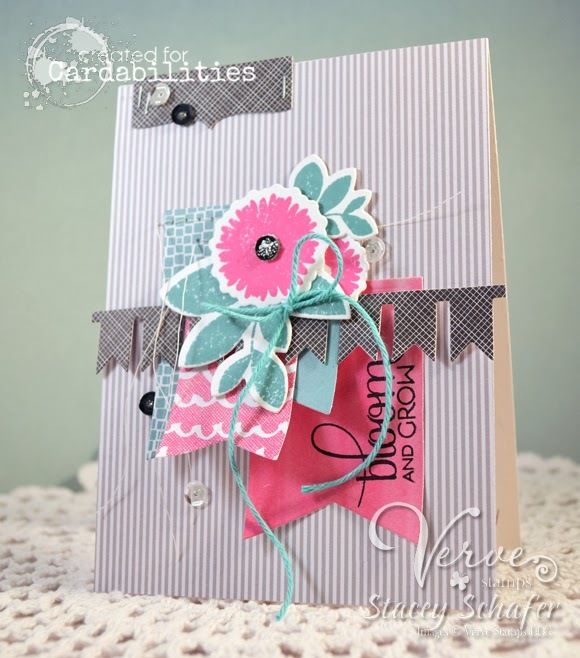 This stamp set, Bloom & Grow, from Verve Stamps makes me happy and exudes the feeling of spring! The Viva la Verve February Week 3 included this gorgeous inspiration photo! I adore the black and white with splash of green and pink floral! 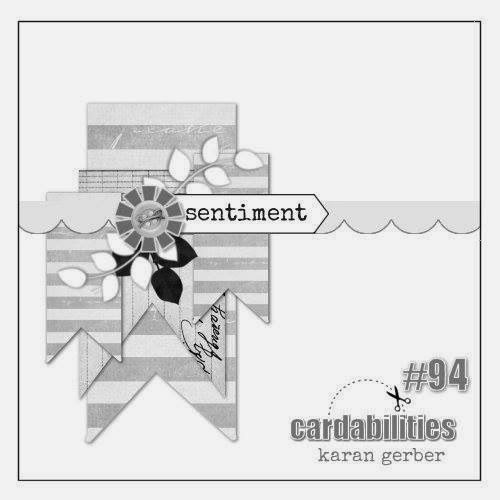 There's also a brand-new Cardabilities sketch up and running today...#94! It is the perfect sketch to show off those darling flowers from Bloom to Grow and my new banner dies! The Pink Elephant's Challenge this week is to use PINK... got that covered! I inked up the leaves and flowers from Verve's Bloom & Grow with distress inks, stamped onto some crisp white card stock, then die cut them with their coordinating dies, Elegant Leaves and Floral Circles. That fabulous Pennant Trim, Banner Bundle and Flag It work together perfectly to create a collaging and dimensional effect! The beautiful sentiment from Bloom & Grow was stamped over one of the banners at a vertical angle for some extra interest! LOVE my Verve! I added a few embellishments from Pretty Pink Posh, too! The aqua twine and sequins are ultra fabulous! So pretty Stacey, love the colors! This is stunning :) love the colors by the cluster of flowers !! Stacey, excuse me please, that I made a mistake in the spelling of your name. great colors and I always love your banners! Oh, this is a total WOW card, Stacey! Love every little detail! Very pretty card! Love that color combo.